Cuda was swimming in a lagoon. She was wearing her full suit of black armor with it's glowing green symbols. (The symbols are gems.) She was guarding a small group of Barracudas feeding there. She was an expert at observing her surroundings. Although predators could come from above or from the beach that was around the lagoon, she was pretty sure they were safe for the moment. Cuda splashed the surface with her fish tail. She wasn't exactly a fan of all the kelp, but she had to keep the Barracudas safe from both dragons and other predators like sharks. She brought out some water-proof paper, a vial of squid ink, and a fish rib and started to sketch her next project, iron armor studded with emeralds and sapphires. She would start making it once she got back to her workshop in Seawing territory. But for now she had to guard these Barracudas. At least they would be done feeding soon. I am also Elkas, Jadespine, Warglory, Eveningsong, Echostorm. [20:47:03] * Barracuda give Baldi a bubble gun and a party hat. [20:47:42] Barracuda : TAKE THESE! THEY SHALL HELP YOU ON YOUR JOURNEY! [21:46:16]	XDemonBloodWolfX : wheres the wiki? A quiet rustle, and the Seawing Leader and Healer stumbled into the clearing-landing heavily on her chin, grumbling to herself about vines. The Seawing healer had grown slightly more irritable since Atlas had also left the tribe, though he said he'd return, but she was still upset. This was the second time she'd been left by a dragon she was close to, and a leader. She pushed herself up as a large black catfish waddled in after her, and a bubbling purr started up as Corry rubbed his cheek against her jaw, the long whiskers on his nose tickling hers. She managed a smile, and looked around. Then paused when she noticed she wasn't alone. "Oh, hi." She said, managing some amount of cheerfulness. "You're Barracuda, right? The new Vulcan?" "Well duh" she replied. "What did you think I was, a hatchling?" a young barracuda was nosing a strange black catfish that seemed to have legs. (Does Corry have legs?) "What the heck is that thing?" Cuda asked, pointing rudely at it. "Retaz, come back, spoke the lead Barracuda." The smaller one, Retaz, nodded and zipped back to where Cuda was standing. She nodded at Retaz and spoke "I think it will be safe, but you can never tell." Of course, they were all speaking the language of the barracudas, so Shine probably wouldn't understand what they were saying. Shine hardly took offense to the rude tone. Finally someone who doesn't treat me like royalty. She thought gratefully, then turned to the catsfish who sniffed at the small fish curiously. His keen green eyes followed the small fish and looked at the barracuda's curiously. They were far too large for him to catch, so he contented himself with watching them curiously. "Oh, him? That's Corry. My catfish." The black creature looked up at the mention of his name, before crouching at the edge of the lagoon to watch the fish curiously. She bent down, almost exactly mirroring his position, and set her head on the grass. "I'm Shiningwater." She said. No need to add her titles. She didn't want to be treated specially. "I thought I was the only one who knew about this place." She knew of plenty of places, and there were a few that were very, very secret. Arcke flew upwards from his giant tree in a distance and tried to locate the nearest pool, not being able to find one he landed in the ground as he retracted his wings and rustled around in the woods, making quite the racket echoing through the forest, settling on a rock he looked around and heard some echoing of voices, accounting it's low volume it would be close to a water source. "Well evidently you thought WRONG. Apparently you haven't considered the fact that fish might actually find their way here. If you know so much about it, then how come you didn't think of the fish?" She asked in an incredibly rude voice. "She is way too optimistic." She told the lead barracuda. "Wouldn't you agree?" She asked. He nodded and replied, "I can tell even without" speaking your language. Then in the normal language of the dragons she said, "Catfish eh? Now there's a bad one. What is that rustling noise? Another blundering idiot? Awesome." Shine tilted her head. "I was mostly talking about other dragons. I've seen fish in every secret water hole I've been too. Some I'm not sure how they got there." She answered simply. Shine wasn't one to be easily riled. Then turned her head to the Barracuda's. "I see I'm not the only who treats fish as something other than a meal." She said, slight humor in her voice, then looked down as Corry poked one webbed paw into the water curiously, evidently waiting for a reaction from the large fish in the water near him. Shine shrugged. "I didn't come up with the name for their species. I think it's a bad pun too." She said, then turned as the Vulcan mentioned noise, and she could hear it too. Corry's ears twitched and he turned at the noise as well, leaving his paw in the water. Sheildwing came along, with his new pet, Charlie the triceratops, having some fun. "INCOMIIIIIING!" 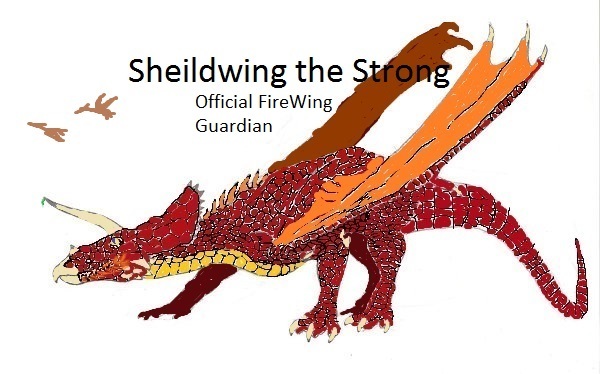 shouted Sheildwing, as he spit a fireball just before he landed in the forest near the water source, resulting in a large explosion, enough to even rattle the water source itself. The two were OK, but they were covered in black from the explosion. Shine twisted and ducked out of the way as a fireball suddely shot towards them, and exploded. She coughed loudly as soot filled the air, and immediately whipped around, snarling loudly at the Firewing responsible. She opened her mouth to deliver a smart warning, when Barracuda delivered it for her. She still glared at the dragon, and Corry managed to huddle behind one of her legs. "What're you doing so far into Seawing Territory, anyway?" She snapped. Shine was kind to everyone, and was very lenient when it came to borders. But when a Firewing smashes next to the Vulcan and Queen when they're alone and unguarded was just suspicious. Not to mention launching an exploding fireball at them. "Tensions are running high between are tribes-at the least-and we agreed not to go into each other's territory!" She snapped. Then her eyes narrowed dangerously. "Or is ShadowFire pretending that didn't happen? Because that is a fight you would loose. Water trumps fire every time." She hissed, taking up a very defensive position, ready for anything. Sheildwing quickly grabbed Baby Charlie before he could get slapped. "I wasn't trying to attack anyone. I was just bored. Thanks for the wash by the way." said Sheildwing, as he flew to the other side of the water source, washing the soot off of him and Charlie. Coaxoch was flying over the SeaWing territory, looking for a certain herb that could clear up heat rashes. She was a healer and had gotten permission from the Queen to take small amounts of the uncommon plant. She was soaring back toward the FireWing territory with a pawful of the herbs when she heard shouting from a lagoon below her. She flew down towards the roars, concerned that someone might have been injured. Landing on the marshy ground, she glanced around. She had heard the jab about Shadowfire, but she tried not to let it get to her. "What's going on here?!" she yelled over the din, wanting to calm thing down before a serious right started. "Bored. You blew up a lagoon in someone else's territory because you were BORED. You are JOKING. That is THE dumbest excuse I have EVER heard. You and that brainless lump destroyed this place because of BOREDOM." Barracuda said. Then she turned to the other Firewing. "You know, I have this vague feeling about this being Seawing Territory, how odd. Now will you please remove three-face here so he doesn't try to char anymore dragons relaxing in lagoons? He tried to obliterate this very pool with a FIREBALL. My sketch is RUINED and my armor is CHARRED. Not to mention he got the queen too." Barracuda replied. She had a sharp tongue and was in a horrible mood. "Oh, and you're not welcome, I wasn't trying to help." But Sheildwing was already gone. While Barracuda was ranting, he put the fallen trees back in their place after the explosion. The only traces left were the footprints and the soot. Shine huffed loudly at the gaurdian, before turning apolgetically to Coaxoch. "Barracuda, this is Coaxoch, Firewing healer. She has my permission to come and gether herbs here every so often because Seawing territory is one of the few places it grows abundantly. Coax, this is Barracuda. Our new Vulcan." She said, glancing between the two during the introductions, then turned her gaze fully to the other healer. "Sorry about the jab at ShadowFire. "She said. "It's been rough since Atlantis left and that was really uncalled for." She sighed, sliding into the lagoon to wash off the soot. Corry followed, though the soot didn't show up well on his black scales. "Did you find the herbs?" With the tension somewhat relieved, she gave a bow of respect to Barracuda. "Nice to meet you." she said, pleasantly, although she had a feeling that this dragon would in no way reciprocate the friendly greeting. She turned to Shine. "It's ok about Shadow. I know it all must be very stressful for you. And, yes, I did find the herbs. Thank you again for letting me gather them." Coax said, smiling kindly to Shine. "I've also got some calming herbs that grow at the bases of volcanos. If you want some for you and your tribe, just tell me and I'd be glad to fetch some for you." 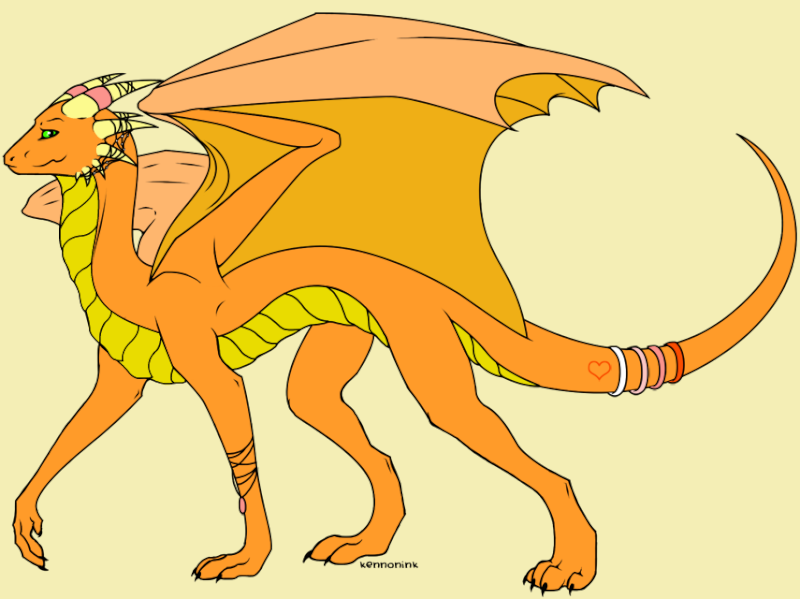 Arcke flexed his ears and more voices appeared, now he was NOT dreaming, Arcke flew upwards and flew towards the sound, his wings opened wide while he glides through the air with a huge shadow under him. after around 3 minutes of listening Arcke had saw himself in a lagoon like he thought, what he saw was a group of dragons luckily and not violent ones at that, some of them were his buds! Arcke's shadow swooped over them, then in a quick motion, Arcke landed on the side of the lagoon, then looking up as he retracted his 32 ft wings he saw more than he wanted, it was Shining! and footprints to seem what's left of Sheildwing, a triceratops like dragon. Arcke toddled over to the group in a happy manner and raised his paw in a hello, then he realized they were already introducing each other and put his paw down a little. "Ehm.... Hello! I'm Arcke, *sigh* im not as shy as this usually, I need to get out of the tree more.. Ahem, Im Arcke the SkyWing Lieutenant!" Arcke said shoving aside his developed shyness, then raising a paw and waving it at Shining, the dragon version of a human wave, his tail moving around behind him like a dog. Cuda looked at the newcomer. Her private lagoon was getting a bit crowded. At least three-face had left. She didn't want to be blown up. "Horribly annoying to meet you. Was that an insult? Because no one is going to tranquilize me. I do have armor even if I can't fly. The skywings havve decided to join the party too? Amazing. I'm starting to wonder if this is really neutral ground. I'm betting an Icewing will show up next. Let me guess, you gave him permission to walk around chatting." she lashed her tail through the kelp. Cuda had submerged her head partway under water so she could breathe through her gills and still speak and listen to those who were above-water. Shine didn't look at the dragon behind her as she frowned. Then shook her head and smiled kindly to the healer. "I'd like that. I have some here, but they don't work very well. Maybe these other ones work better?" She mused to herself as she pulled out of the water, having washed off all the soot. Corry followed and trundled up her tail, settling between her wings and starting up a surprisingly loud bubbling purr. She then tilted he head as Arke landed near her. "Hey, Arke. Been a while." She said, smiling. Then frowned at Cuda's introduction. "Arke, this is Barracuda, new Vulcan." She said, knowing that the dragoness wasn't going to introduce herself. Coax opened her paled wings to catch the wind. "I'd better go. There's a new batch of hatchlings coming and it's common for them to get heat rashes. she said. She smiled and nodded to Shine. "I'll bring the herbs by tomorrow. See ya later, Shine. She attempted to look nicely toward Cuda, but she wasn't sure she was able to keep the dislike from her eyes. She didn't take kindly to those who insulted her friends and first impressions were very important to her. "Bye, Arke!" she cried as she flapped her wings and started back towards the FireWing territory. "Bye! Ehm.... Psst is her name like Coa-something Shine?" Arcke said then whispered, then turning back to the group, "nice to see you again shine! And hello Barracuda, I'm Arcke SkyWing lieutenant! And Erm...... No my home is just close to the border of the neutral lands as all." Arcke replied to the statement shine gave Arcke to walk around chatting. "oh wait, am I interrupting something...?" Arcke said gently as he realized, why that serious tone Barrucuda has. Equinox darted down to her father's side and delivered him a large whole-hearted hug, and she was just about to tell him about the huge boar she caught a while ago, when she realized that Akreious seemed to be in the middle of something with an angry-looking SeaWing. "Oh!" she exclaimed in shock. "I'm terribly sorry for interrupting so rudely!" She ripped off a small silver chain imbedded with sapphires around her neck and passed it to the furious SeaWing. "Uhh... just a token to make my apologetic-ness apparent..."
She turned away when she saw a friend she made at the Winter Gathering. She flew to her friend's side with her big wings. "How are you? Gee, I still can't stand how incredibly... red your scales are!" Realizing what she said and afraid if she offended Shieldwing, she stammered, "It's a good thing!"